Workshop #9: A New Addition! Well I have been watching Craigslist almost daily in order to find a bandsaw. Last night I did and sent a message quick to the seller. Went to look at it this morning and bought it. At under $100 it looked to be in great shape and runs good. Older Sears/Craftsman model with tilting head. 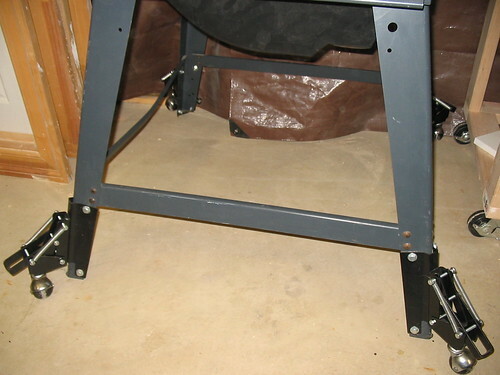 Has the fence and miter gauge as well as some nice casters and I was able to find the manual online for it. I plan to do a bit of tuning up on it in the next month or so and can hopefully put it to work working on Christmas Gifts. The only real downside I see is that it is a little bit bigger then I expected it to be so I will have to work around it for a bit until I can reconfigure the shop yet again :). 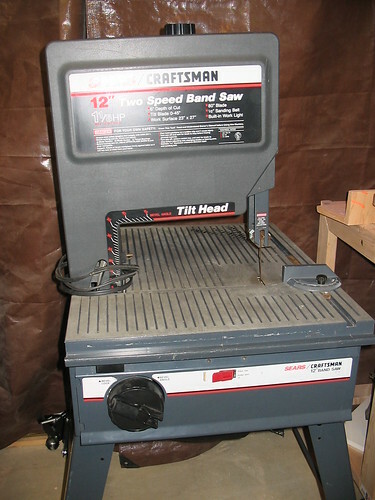 I’ve got an older version of that saw but the 14” one. It does the job. I don’t want to do any log resawing with it but my general day to day bandsaw needs in the shop; I never give it a second thought. That looks like a great saw to make angled cuts with that tilting head. I hate to make cuts on a tilted table. Looks like that will be a great saw for you. Good score! Good find, great price. Enjoy.